Germany-based Evonik Industries has broken ground in Marl for construction of a new production plant for speciality polyamide 12 (PA12) powders. The speciality chemicals company will thus increase annual capacity for its Vestosint PA12 powders by 50%. The amount invested lies in the mid-double-digit million euro range. The new plant is scheduled to come on stream at the end of 2017. Ralph Sven Kaufmann, CEO of Evonik, says: "Organic growth is an essential cornerstone of our long-term growth strategy, which is why we're continually investing in new capacities and innovative products. With the Marl investment we're also further consolidating our leading position as a supplier of polyamide 12 based high-performance polymers." Evonik's Resource Efficiency Segment is the market leader in polyamide 12 powders, which are used, for example, for coating of metals in household goods such as dishwasher racks, in the automotive industry, and in medical technology. For many years Evonik has also been developing speciality polymer powders that allow industrial production of high-tech components in 3D printing. 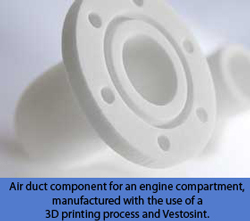 Vestosint is a modified PA12 powder produced from polyamide granules by a special proprietary process at Evonik's Marl site.